Do you have a minute to spare to learn some English? Tom untangles the trouble with everyone and anyone! Give us 60 seconds and we'll give you the English! Hello, ladies and gentlemen! Tom here for BBC Learning English. 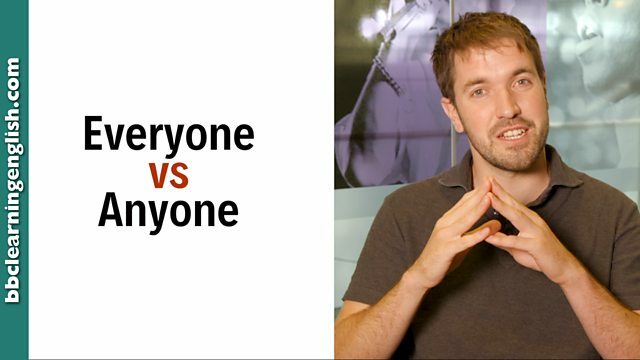 Today I'm going to explain the difference between everyone and anyone. When I say 'hello everyone', I'm talking to all the people in a group or all the people watching this video. Anyone, however, relates to any one individual person in a group, and we often use it to ask questions. For example: Is anyone listening? Or: Can anyone answer today's question? Here I'm asking if any individuals in the group are listening. If the whole group is listening, we can say: Yes, everyone is listening! - Which is something that English teachers love to hear. In expressions such as 'everyone', 'anyone', 'no one' -one refers to a person or group of people. There is no difference between everyone, anyone, no one and everybody, anybody and nobody. Everyone refers to all of the people within one particular group. It is used with a singular verb. Everyone knows that the moon is made of cheese. So I asked everyone to meet in the hall at 6pm. Anyone is often used in questions and negatives and refers to one individual person within a particular group, though we may not know who they are. It is used with a singular verb. Do you know anyone who can fix cars? I'm not sure anyone feels the same. Is there a difference between '-one' and '-body'? Anyone refers to on individual in a group, everyone refers to all members. Which sentence makes the most sense?